BAER testing is the standard method to test for deafness of one or both ears in dogs and cats. BAER stands for brainstem auditory evoked response. The test typically takes only a few minutes to perform and is perfomed without sedation. BAER testing is now available from The Veterinary Hearing Service (VHS) a mobile clinic based in the Midlands. Veterinary surgeons can also request The Veterinary Hearing Service to visit their practice and to perform hearing tests on an indivdual or a group of their patients. Dogs and cats that are to be bred should be free from inherited problems that might be passed on to their offspring. 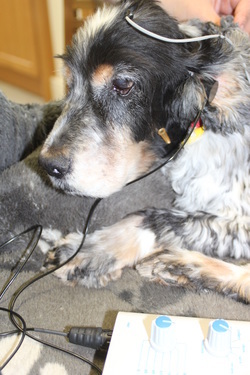 Although it is quite easy to tell if an animal is totally deaf, most affected animals will be deaf in only one ear and this can only be detected using BAER testing. The dogs breeds that most commonly are affected include Dalmatian, English setters, bull terriers and cocker spaniels but other affected dog breeds are listed here. Cats with white hair coats and blue eyes are most likely to be affected - this is the case whether they are pedigree or not. Pedigree cat breeds that may have this colouration are listed here. Dogs and cats of affected breeds may be tested as kittens and puppies prior to being sold to ensure that their hearing is normal. There are several reasons why a previously healthy dog or cat may lose their hearing. Sometimes this can be very useful information to have when planning the best way to manage ear disease. For example sometimes otherwise effective medicine are not used because it is known that they might damage hearing. In these cases knowing that the pet has already lost their hearing can mean that these medicines can be given. It is common for dogs to suffer from great discomfort with long-term ear problems and for medical treatment to be difficult. Major surgery such as removal of the ear canals (called a TECA - total ear canal ablation) is often considered and usually enables the dog to live a pain-free life afterwards. But one side effect of this operation is that the dogs have little hearing in the operated ear afterwards. Testing the hearing of dogs that have suffered from more severe ear infections enables vets and owners to make an informed decision about whether to continue with medical treatments or to switch to a surgical solution. If the dog is already deaf in the affected ear then medical treatment is no longer worth continuing as surgery is more likely to give long-term satisfaction - both clinically and being cheaper. Dogs with ear disease usually have a skin problem that can be helped by a veterinary dermatologist. David Godfrey is available to see pets at clinics in the West Midlands. Please see the David Godfrey Dermatology website. If the ears are too badly diseased or if the ear is already deaf then David Godfrey will tell you and can arrange for appropriate surgery to be performed.